Whitney Vickers | Greene County News Fairborn High School has accomplished the Greene County Safe Communities Coalition Seat Belt Challenge for the sixth time in a row with 100 percent of its students buckled. FAIRBORN — Fairborn High School students have gotten into the habit of buckling up every time they get behind the wheel and have proven so by winning the Greene County Safe Communities Coalition Seat Belt Challenge with 100 percent of its student drivers buckled for the sixth time in a row. Hern, alongside Physical Education Teacher Jake Dysinger, watch student drivers pull away from the grounds every day after the final bell rings. They highlighted that the habit is so embedded into their routines that some will even pull the belt away from their chest to show them that it is fastened. Both added that they ensure that all passengers in the vehicles are buckled as well. If a passenger is not buckled, the driver is held accountable. Hern said according to the law, drivers can be cited if their passengers aren’t buckled. Hern highlighted that Greenview High School followed closely behind them this round of the Seat Belt Challenge and recognized that other schools are gunning after Fairborn High School’s success. However, he emphasized that having more Greene County students buckled is a good thing. The school once chose not to participate in the challenge in a previous round to allow another school the opportunity to win. However, Hern said the students were still 100 percent buckled during that period of time. 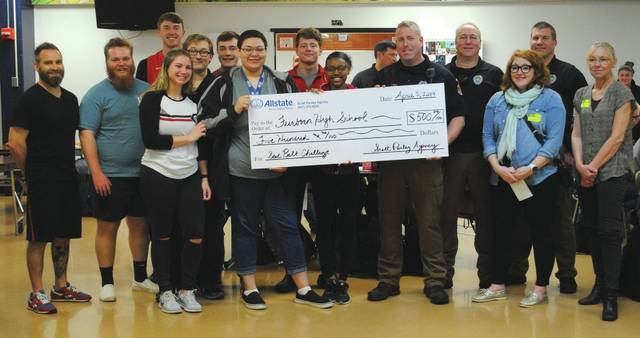 https://www.fairborndailyherald.com/wp-content/uploads/sites/50/2019/04/web1_seatbeltchallengeFHS2019.jpgWhitney Vickers | Greene County News Fairborn High School has accomplished the Greene County Safe Communities Coalition Seat Belt Challenge for the sixth time in a row with 100 percent of its students buckled.